This article is coming just over the half way through of the Crossfit Open and I am sure some of your are starting to get a bit sore. Now that your body is getting tired from 13.1-13.3 workouts you need to make sure you not only keep enough fuel in the tank for 13.4 and 13.5, but you also stay injury free in the process. Here are some key points to remember going into the final 2 weeks of the open. 1. Take Rest Days – Dont try to do the work out on back to back days to better your score. You are likely to end up with a lower score on the second day, as well as open your self up to the possiblity of injury. Your body needs time to rebuild and recover after intense workouts. This is gives us the capacity to get stronger, as well as prepare for the next workout. If you are going to be re-doing the open work out give your self a rest day in between. 2. Make sure Rest Days are ACTUALY Rest Days. If you are resting in between open workouts do not subsititute for another high weight/high intesity WOD. Instead still go to the gym but lower the weights and intensity. DO NOT go for PR on this day!!!! You are better off to lower the weight and focus more on technique and increase reps for the day. 3. Add in some light cardio on your rest day. Light aerbic exercise is good to help flush lactic acid and improve muscle recovery. After an open workout it is good to get on the rower, on a spin bike or into the pool for a light aerobic session. 4. Nutrition – Make sure you are getting the proper nutrition and hydration before/during and after you workouts. This will not only help performance but also your recovery and future performances. If you are not sure what to be eating talk to a nutritionist who works with athletes (I have a few names if you need them). There are also some natural anti-inflamatories like traumeel that can be used to provide the body with a systemic anti-inflamatory that will promote recover. 5. Sleep – Just like nutrition, getting enough sleep not only affects your performance but how well you are recover post workout. Try to get 8 hours a night whenever possible. 6. Stretching and Foam Rolling – If you have areas of tightness or soreness make sure you are stretching after you work out and doing lots of foam rolling. This will help break up scar tissue, promote recover and improve mobility. 7. WARM UP!!! The open workouts are intense. Make sure you are doing a proper dynamic warm up first. Most crossfit gyms have a sample warm up posted on the wall, but if you are not sure what to do ASK! 8. Get Physiotherapy/Massage Therapy – soft tisue techniques like massage and ART are designed to increase blood flow to soft tissue and break up scar tissue. Soft tissue work after a heavy workout/training session will help promote recovery and remove lactic acid build up. Physiotherapy can also help to address any areas of joint restrictions or muscle imbalances. 9. Taping/Bracing – If you have areas of pain or stiffness talk to a physiotherapist and see if any bracing or taping may help. There are a lot of braces and tapes on the market that will help to decrease muscle tension where needed, provide joint stability or increase muscle recruitment. Some examples are Rock Tape or DonJoy Braces. 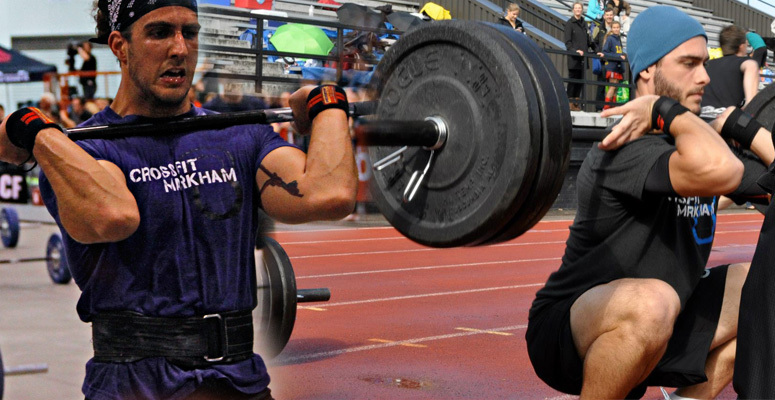 GOOD LUCK to tveryone competing in your last attempts at 13.3, as well as 13.4 and 13.5! If you have any questions or want to book an appointment feel free to contact me! 647-294-7173, info@innerstrengthphysio.com Or use the link to book online! BOOK YOUR APPOINTMENTS ONLINE NOW!!! Inner Strength PHYSIOTHERAPY is now accepting appointments ONLINE!!!! At Inner Strength PHYSIOTHERAPY we are trying to take your schedule into mind. As such you can now book appointments online from the convenience or your home, work or on your smart phone! If you click any of the links on the www.innerstrengthphysio.com website you will be directed to Mind Body. You will have to create a user name and password and then you are set! This program will allow for Inner Strength PHYSIOTHERAPY to send you reminder emails about appointment times, email reciepts and much more. Once you are onto the mind body site you can look up appointment availability. Choose the time and location that works best for your schedule. Once you have selected your time wait for the clinic to confirm. Once confirmed appointment times can also be easily imported into your work schedules as well. If you can’t find a time on the schedule that suits your needs call (647) 294-7173 and we will arrange something that does. INNER STRENGTH PHYSIOTHERAPY IS EXPANDING!! Inner Strength PHYSIOTHERAPY is opening the doors to a second location in Woodbridge, Ontario. This big news is coming rather appropriately almost in time for Inner Strength PHYSIOTHERAPY’S first birthday in April!!! Inner Strength PHYSIOTHERAPY was openend in April 2012 with the goal of offering INDIVIDUALISED treatment, ONE ON ONE treatment times, EXTENDED treatment times and a focus on HANDS ON MANUAL THERAPY. At Inner Strength PHYSIOTHERAPY our goal is to get you better as quickly and safely as possible and to get you back doing the things you enjoy. This mean offering CURRENT treatment techniques that are EFFECTIVE, EVIDENCE BASED, INDIVIDUALISED and FUCNTIONAL. We are very excited to be opening the doors to the first patients at the WOODBRIDGE location Inner Strength PHYSIOTHERAPY next week Wenesday March 6, 2013. The second location is 171 Marycroft Avenue, Woodbridge, Ontario, L4L 5Y6. It is convienientley located close to Hwy 400 and in between Hwy 7 and Hwy 407. If you live west and were driving into Markham, OR if you have better access to the 400 into and out of the city this location will be PERFECT for you! Come by and check out the space! Outdoor running in the winter brings a whole new list of challenges. Make sure you are prepared for anything mother nature brings your way. Some important things to take into consideration are the lack of light, slippery conditions and temperature. Some things that help combat these issues are making sure you are wearing weather appropriate materials and layers. This includes snow gear, always wearing reflective items and a bright light of some sort, remembering to hydrate in the winter just as you would in the summer, trying to stick to main routes that have been plowed and salted, staying alert and keeping the volume down on music or not using ear phones and most importantly always running with someone else and telling someone your route when you leave. 1. WINTER RUNNING CLOTHING AND LAYERS – Luckily for us running gear has come along way and there are tonnes of products out there that do an excellent job and keeping you warm and dry through some of the worst winter days. Here are some important items to include in your gear drawer (or 2 chests of drawers if you own the same amount of gear as me!!!!). BELACLAVA, HAT, EAR WARMERS – We lose most of our heat from our heads, therefore it is very important to make sure you invest in a good quality hat or ear warmers. On really cold days you might also need to cover your whole face with something like a belaclava. A belaclava is good to protect your skin and face from the elements. On milder days you might only need a head band to cover your ears. CHAPSTICK/VASOLINE – A protective layer of vasoline or chapstick on your lips and face can also help to decrease the affect of windburn in the winter. LAYERING – With winter running clothing you want to wear layers for a few reasons. The layers help to trap heat in, but also help to wick moisture from the inner to the outter layer where it is evaporated. Wicking moisture to the outter layer essentially keeps you warmer and dryer. INNER LAYER/WICKING LAYER – The layer closest to your skin should be a synthetic wicking fabric. This will hlep to wick moisture away and kep you warm and dry. The BIGGEST mistake is to wear cotton as this layer. Cotton will absorb moisture and sweat which will make you cold. INSULATING LAYER – On really cold days (-20 and under for me personally) you need to add an insulating layer. This is usually a microfleece. Something that adds an extra layer of warmth but should still be a layer that wicks moisture to the surface. You want to have some air exchange through this layer to all some heat out, however keep the majority in. Light weight microfleece tops are my choice here. WIND BREAKING LAYER – Your most outter layer should protect you against wind and moisture (sleet, hail, snow, rain) but also allow some heat and moisture to esacpe. Jackets with zippers are good to help you regulate heat, also jackets that are easy to fold up and tie around your waist if you get warm are great. Some jackets also come with zippers under the arms which allow a vent for heat to escape if you get too warm. This layer should also have some reflective material to help with running safely when its dark out. Jackets with a back pocket are also great because you can put extra gear there in case you need it or when you get warm ie. mitts, gloves, hats. GLOVES/MITTS – We lose a lot of our heat from out feet and hands. Make sure to use a good pair of moisture wicking gloves. There are thin ones that are great for not too cold days and on colder days get a thicker pair of wicking gloves or mittens. Mitts are great because your fingers share heat and warm each other up. Mzke sure your mitts are also a wicking material so that moisture is not sitting inside the mitt next to your skin. RUNNING PANTS – Tights or running pants with reflecgtive strips that are made of a good wicking material are usually enough in the winter. On really cold days you might have to add a base layer of wicking type long john underneath as well. Our legs dont tend to lose as much heat as our upper body does so you wont need as many layers on your legs as your torso and arms. RUNNING SHOES/SHOE COVERS – There are products you can buy and put on your shoes to add grip, and also covers you can buy to put over your shoe to prevent snow and slush from getting inside. I tend to wear my normal running shoes all winter and try to avoid stepping in puddles and slush and getting my feet wet. If you live in wetter areas ie; Vancouver, you might want to consider puchasing a trail running shoe in the winter. When I lived in Vancouver, BC due to the extreme moisutre and cold rain in the winter I switched to a North Face trail running shoe made of gortex. They were great because they kept my feel warm and dry. The only down side was that the gortex is very good at keeping moisture out and as such keeps all the heat in. I found my feet would over heat and I could only use them on really cold days. SOCKS – NEVER wear cotton socks. Socks should be made of a wicking material so your feet stay warm and dry. Wet feet are more likely to decrease your total body temperature and will increase the likelyhood of blisters. 2. REFLECTIVE ITEMS – Always assume cars dont see you and be alert! Wearing something reflective; as well as a light attached to your clothing at night or on darker days will help the chances motorist will notice you. Most running clothing has reflective strips on it and you can also purchase lots of winter running gear in bright colours like flourescent yellow and orange. There are lots of great lights you can buy to attach to clothing that are white, red, flashing etc. Make yourself AS VISIBLE AS POSSIBLE when you are on the roads in the winter. 3. HYDRATION – It is eay to forget about hydration in the winter. Make sure to take fluids with you on long runs and to stay hydrated just as you wuold in the summer. On really cold days you might find your water bottles freeze. You can start the run with warmer water to help prevent or delay your water bottles from turning to popsicles. 4. MAIN ROUTES AND PLOWED/SALTED ROADS – Especially after a snow fall or ice make sure to stay to main routes. These are the streets and sidewalks that are most likely to be plowed and salted first. Point out icey patches to runners behind you as you pass them to give them a heads up. 5. STAY ALERT AND RUN WITH A BUDDY – Always run with someone else, especially at night when its dark and especially in the winter. Make sure to have a cell phone on you for emergencies and always tell someone before you go out what route you are taking and roughly how long you will be. Winter running is all about being SAFE and PREPARED!!!! Make sure you have the right GEAR, are VISIBLE and ALERT!!!! Other stores like sports check, national sports, nike, lulu etc also carry gear that would be great for winter running. As always remember to increase your training gradually, listen to your body and if you are experiencing pain have it checked out by a professional!! Have a GREAT and SAFE winter on the roads!!! Season two for the Canadian Lacrosse League CLAX is now under way. Once again Lisa Regan from Inner Strength PHYSIOTHERAPY will be working at the Physiotherapist/Athletic Therapist for the Durham Turf Dogs. Last season the Turf Dogs finnished the regular season in first place, however had a dissapointing loss in the semi-finals. The Canadian Lacrosse League (CLAX) is a Canadian Mens Professional Box Lacrosse League. The league consists of teams from Durham, Toronto, Barrie, Brampton, St. Catherines and 6 Nations (Iroquois and Oshweeken). The Durham Turf Dog’s home arena is GM Arena in Oshawa. Durham will be hosting Toronto for their first home game January 27. Regular season games start January 12/13. The Turf Dogs have been practiing since November 7 and have had 2 exhibition games against Toronto so far this season. We are getting ready to for an amazing 2013 season.. Check out the CLAX website for information about games and times. Lisa Regan has passed her FCAMPT exam!!! Congratulations!!!! Inner Strength PHYSIOTHERAPY is very happy to announce that Lisa Regan – Physiotherapist and Athletic Therapist passed her “Part B” or “Advanced Manual and Manipulative Therapy” exam. What does this mean you may ask. The process to get pass this exam takes years of post graduate courses where physiotherpists learn advanced manual therapy skills, as well as manipulations for peripheral joints and the spine. The process has 5 levels each which include course work and one or more written exam. At the half way mark physiotherapists have to complete the “Part A” or “Intermediate Manual and Manipulative Therapy” exam. Candidates also have to obtain mentorship hours under a physiotherapist who has completed the process in order to be eligible to attempt the final exam. The final advanced exam consists of a 3 hour mutliple choice, 3 hour case history and a 2 hour practical exam. This has been a very long but rewarding process. The skills learned will help to provide patients with the most effective, efficient, individualised, research based, and reliable treatments to get them better safer and faster. Inner Strength PHYSIOTHERAPY focuses on INDIVIDUALISED appointments and EFFECTIVE, RESEARCH BASED, HANDS ON techniques. This extra credential is also a way for other health care profressionals to recognise the advance training that Lisa has obtained. FCAMPT is an internationally recognised designation. For more information check their website. IFOMPT provides world-wide promotion of excellence and unity in clinical and academic standards for manual/musculoskeletal physiotherapists. 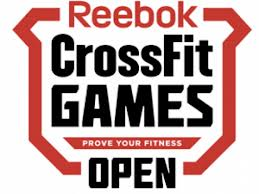 Chris Christini of Crossfit Markham has recentley opened Reebok Crossfit East Woodbridge. Thank you to everyone who attended and participated in this event. This is a great new facility with amazing coaching and programing thanks to the Cristinis. You will want to check out this space for sure!!! Inner Strength Physiotherapy will also be opening the doors to a second location inside Reebok Crossfit East Woodbridge in the new year! It is a very exciting time! The grand opening was a success. A lot of big names in the Reebok Crossfit world attended. There were different technique seminars throughout the day, as well as workouts every hour on the hour. Inner Strength PHYSIOTHERAPY was also on hand for the Grand Opening treating athletes in between workouts. Overall this was a great event and the start of another amazing crossfit gym. Grand opening information for Inner Strength PHYSIOTHERAPY – East Woodbridge will be posted soon so STAY TUNED!!! Thank you to everyone who attended the Grand Opening and Open House for Inner Strength PHYSIOTHERAPY! Also thank you everyone for your continued support and referrals. The best compliment you can give is referral to your friends/family/doctor! The clinic is growing and there is more exciting new to come including a second locations!!! STAY TUNED! Inner Strength Physiotherapy just added a new electronic adjustable manual therapy bed to the clinic in order to serve you better. Electronic/adjustable manual therapy beds make many manual therapy techniques more effective. 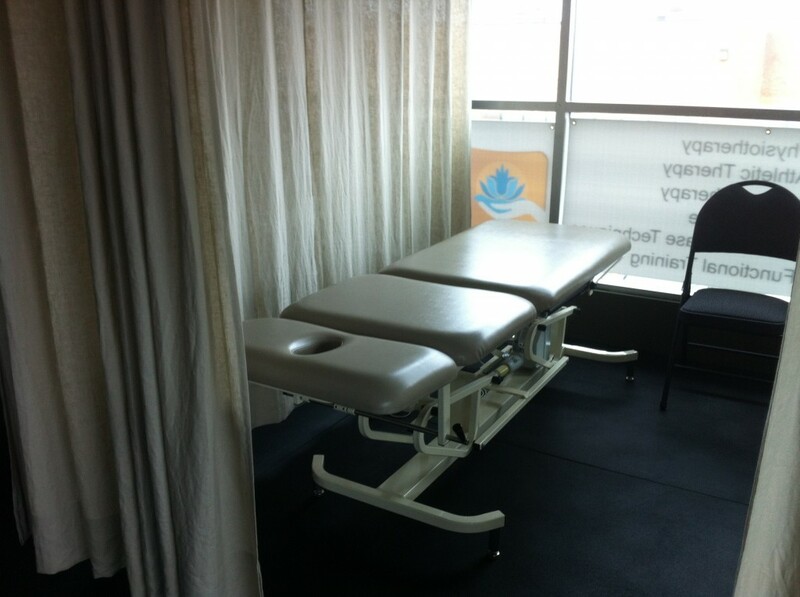 The bed allows the therapist to best utilize their body mechanics which makes many advanced manual therapy techniques more effective and more comfortable for the patient. At Inner Strength Physiotherapy we now have 2 electronic adjustable manual therapy beds and 3 total treatment beds.